Charlottesville, Va., May 19, 2016 – For the past four years, the St. Anne's-Belfield School Learning Village Grades 5 – 8 choirs have performed a children's opera in May under the direction of Ms. Victoria Redfearn Cave. This year the opera Full Circle, about middle school life, was commissioned specifically for the students, all of whom participate in music classes that are open to anyone interested. 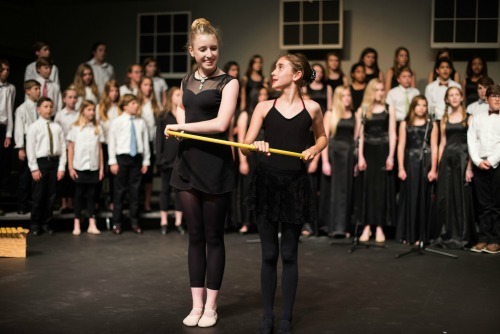 "A children's opera is just a fancy word for a choral work that has a story line and movement," said Redfearn Cave, grades four through eight music and movement instructor and choral director. "I have been hoping for many years to commission a piece. In my twenty-year career, this is a first for me too. I wanted the children to be involved in creating a work on the ground level. They have been involved with the editing and creative process. They have witnessed the inner workings of a librettist and composer. The connection to the process only makes them more connected to the piece artistically." The librettist of Full Circle, Mr. J.J. Cromer, a high school humanities teacher at St. Anne's-Belfield School, was previously a middle school teacher and jumped at the chance to become involved with Redfearn Cave and composer Russell Nadel of the Potomac School in McLean, Va.
"Some of my initial ideas and investigations for the libretto focused on Aboriginal art from Australia, and the idea of circles stuck with me as I next explored Taoism," explained Cromer. "Throughout the beginning stages of the creative process, especially as I thought about the potential for performer movement, the notion of young adolescents and circles started making more and more sense. Social circle, circle of friends, et cetera. I started thinking about how geometric circles are defined and made, how school is a series of cycles, and how something beautiful like a circle or a child comes about. Underscoring all of it is my profound respect for young adolescents. They deserve and need as much love as we shower on babies and graduates. I worked directly with middle school students for eighteen years, so I am proud to honor them." Full Circle is a series of vignettes reflecting scenes from middle school students' lives. A focus on interactions is evident in explorations of what happens at recess, in the course of the day with relationships, between students, and with adults. "Seeking a Circle" reflects Cromer's thoughts throughout his creative process, while the lyric-less "Passing Judgment" is a poignant miniature of the pain caused by gossip, conveyed through the music and movement of fifth grade students. Using the Orff Schulwerk Approach, a child-centered approach to learning, Redfearn Cave acted as liaison between the students and Cromer and Nadel on an almost daily basis. "Our final work is not complete, ever, until we share it with the children," she said. "They have added everything from plate spinning and tap dancing, to powerful drawings about their feelings towards adults. They have had conversations and arguments about their relationships with others and how they feel about school. It has been a complete privilege for me to work with the students and watch them connect so deeply to the piece." Indeed, when Cromer solicited poetry from the choirs the submissions resulted in a piece about daydreams, and ultimately time, as a majority the students wrote about having unscheduled time to explore. For Cromer, this participation is just one piece of a larger opportunity for the students involved. "Art holds a mirror up to us, telling us about the narrative we inhabit, respond to, and write every day," he said. "Performing, and all the essential aspects of preparation and process that lead to performance, gives students a chance to create art but also create that new narrative tweak for them and for the audience. I also really like how an opera explores themes in sustained depth; the performers have been holding that mirror up for a few months now. They are bound to see and know new things. " Much of this mirror is revealed to audiences in a student-made documentary, Inside the Opera, that St. Anne's-Belfield School sixth grade students produced following studies of scriptwriting and filmmaking with English teacher Debbie Ripley. "The first time I met with the seven students on the Film Committee, Victoria came to the meeting as well," said Ripley. "She explained what she was hoping for in the film and the students seemed to understand immediately. This film was not about the opera itself, but rather about the making of an opera. Since the students were living that on a day-to-day basis while practicing with Victoria, they had lots of great ideas about how to explain the process in a film." Full Circle's world premiere was held at St. Anne's-Belfield School on May 13, 2016, and will be performed again for students of Potomac School in May. Work on the opera commenced nearly two years ago, and was supported by the St. Anne's-Belfield School Fine Arts Boosters organization. As Redfearn Cave told audiences at the premiere, no one involved in the project feels they are at an end, but instead are still deeply involved in its progression. "What they created is something deeply inspired," noted Ripley. "I believe that Full Circle will stay with our students for the rest of their lives."